Lexington, KY – Link-Belt Construction Equipment will showcase five new cranes and Link-Belt Pulse 2.0, the company’s second generation operator control system at its 21,000 square foot exhibit at CONEXPO-CON/AGG 2017, March 7-11, 2017 in Las Vegas. On display at Link-Belt gold lot booth #G3864 will be the TCC-2500, 75RT, 110RT, 228 HSL, 298 Series 2 and HTC-86110 with new fly extend system. “It’s a showdown at ConExpo. Everyone brings their newest and best efforts, and this show won’t disappoint, at least not from our standpoint. 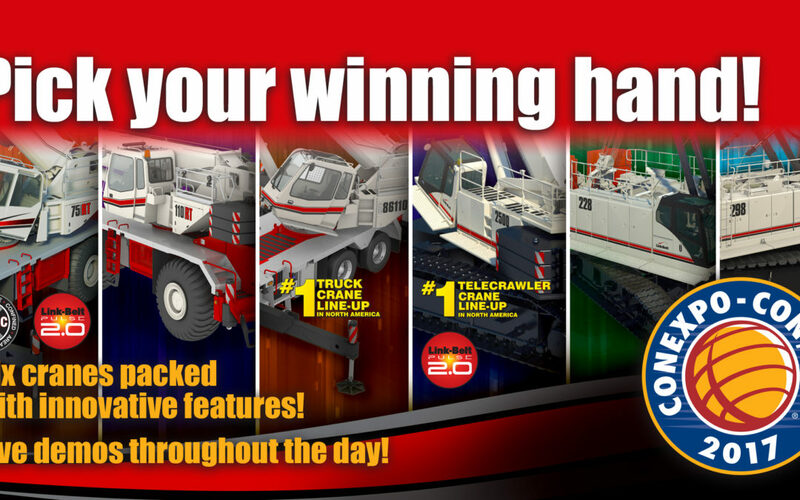 Link Belt will display some great machines that will have our booth packed. We are a well-managed company and we understand the swings of our market – up, down and the in between – as a result, we have no outside distractions. This keeps us focused on our schedule, and that includes our new product development introductions. In fact, everything we will exhibit at Expo will be a first time unit, and better yet, everything at the show will either be in production or will have started the production process. No teasing of showing a unit and then have to take it home and test it. 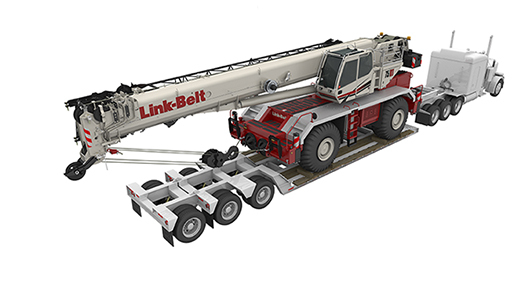 Our new cranes will be ready for work, which is clearly what our distributors and their customers expect,” says Link-Belt Director of Product Marketing, Pat Collins. 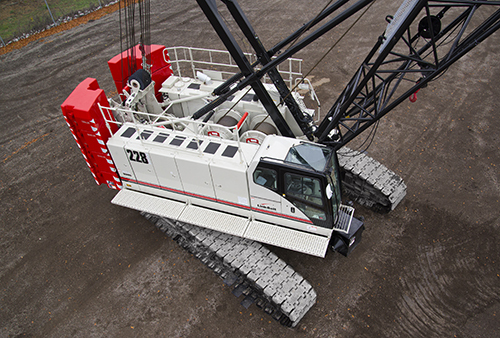 Overall, the 250-ton (230-mt) TCC-2500 establishes a new definition for robust performance for large telescopic crawler cranes. The seven-section 43.7 – 223 ft. (13.8 – 67.9 m) pin and latch boom is the longest in class and offers eight simple boom extend modes. The attachments will also be sure to impress with a three-piece offsettable fly that measures 12, 40, and 67 ft. (3.6, 12.1, and 20.4m) and can also be equipped with two 25 ft. (7.62 m) boom extensions for an overall tip height of 346 ft. (105.46 m). These attachments with optional hydraulic luffing allow for “up-and-over” capacity like luffing lattice crawlers. “Our goal from the beginning was to supply a simplified design, quick and easy to assemble that is operator-friendly,” says Knight. Operator job site view is enhanced with four cameras: rear-view, blind-side swing-view, and two individual winch-view cameras that provide increased job site awareness and control of the job site from inside the cab. The 75-ton (70-mt) 75RT rough terrain crane impresses both on the road and off. It has outstanding reach for its tonnage class and a new operator’s cab has elevated the experience of owning and operating a Link-Belt crane. It transports fully loaded with counterweight under 100,000 lbs. – and under 90,000 lbs. without counterweight. A six-speed transmission on the 75RT is powered by a Cummins Tier 4F QSB 6.7 270 hp (201 kW) diesel engine. The 75RT’s five-section 38 – 142 ft. (11.6 – 43.3 m) full-power formed boom is built to Link-Belt’s own specific boom profile and tolerance in Link-Belt’s formed boom production facility in Lexington, KY. To simplify the process of lifting, only two extend modes are offered: EM1 and EM2. For greater flexibility and efficiency, a two-piece [35 – 58 ft. (10.7 – 17.7 m)] and three-piece bi-folding fly [10 – 35 – 58 ft. (3.0 – 10.7 – 17.7 m)] are both available, for a tip height of 208.7 ft. (63.6 m). The matching main and auxiliary winches have 18,603 lbs. (82.8 kN) of maximum line pull and a maximum winch speed of 485 fpm (147.8 m/min). The new rating of 110 US tons and 100 metric tons brings the base rating of the 110RT rough terrain crane in line with its very successful, market leading sister product, the HTC-86110 telescopic truck crane. Both machines share many common components, including their 164 ft. (50m), 6-section main boom. The 110RT has a six-section pin and latch boom with a length of 164 ft. (50 m) and maximum tip height of 261.7 ft. (79.8 m). A three-piece bi-folding fly [10 – 35 – 58 ft. (3.0 – 10.7 – 17.7 m)] is available with an integrated 10 ft. (3.0 m) section that can be manually offset. Operation could not be simpler with only four boom extend modes and the ability to telescope under load. The boom design incorporates Link-Belt’s standard Teflon wear pucks impregnated into the wear pad surfaces so the boom requires no grease. The 130-ton (117.2-mt) 228 HSL lattice crawler crane is powered by a whisper quiet, 270 hp (201 kW) Cummins QSB 6.7L tier 4 final diesel engine. An operator selectable “auto-idle” engine shutdown feature allows for maximum fuel economy during extended idle periods, and engine RPM’s resume immediately when the throttle is activated. The Cummins power plant couples to a direct drive gearbox powering the Kawasaki main pump package. The crane operator is assisted by on-board high-resolution winch-view, rear-view, and blind-side swing-view cameras to enhance jobsite visibility from within the cab. The operator’s cab is highly functional and comfortable. Inside you will find full LED system monitor, AM/FM digital clock radio, and adjustable armchair-mounted controls. The ergonomic design offers the operator greater visibility, more room, and a six-way adjustable seat. Like many Link-Belt HYLABs, the 228 HSL will offer maximum boom lengths with two different styles of boom: tubular boom, up to 235 ft. (71.6 m) and angle boom, up to 155 ft. (47.2 m). Link-Belt’s open throat designed top section features quick reeve capabilities and will incorporate a fold-down three-sheave-idler assembly. 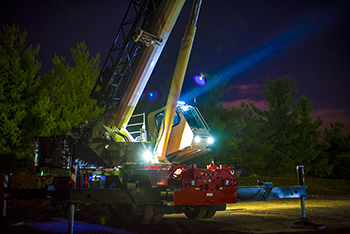 The new boom design is the capstone of the 250-ton (227-mt) 298 Series 2 lattice crawler crane and allows the working combination boom tip section to remain in place when transitioning from conventional mode to luffer with a maximum combination of 180 ft. (54.8 m) of luffing boom and 195 ft. (59.4 m) of luffing jib. The 298 Series 2 will also feature a new base section and 12 in. (30.48 cm) wide boom walkway. Bar pendants with storage brackets replace dual wire rope pendants. A newly designed retractable auxiliary lifting sheave has a capacity of 25-ton (22.67-mt) and offers two parts of line. A new luffing jib transport package with lifting lugs simplifies and expedites luffer assembly. The rear post will scissor into place by means of alignment links. The transport package also comes assembled with nylon rope reeving to assist with initial luffing jib wire rope hoist reeving. Once the rear post is in working position, all luffing jib pendant connections are made and the luffer is ready to be raised for work. All assembly is done from the ground with no work at height exposure. 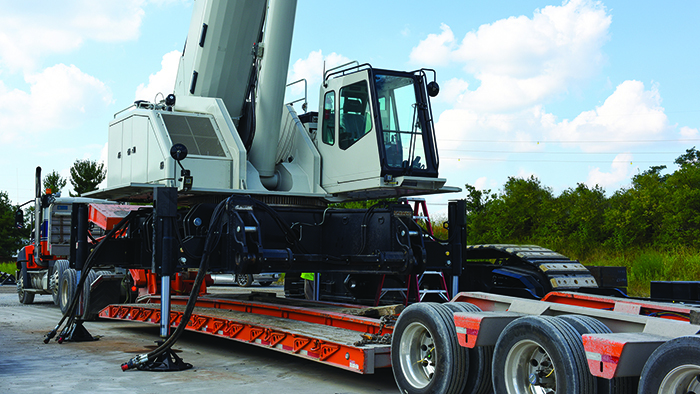 The crane operator is assisted by an on-board high-resolution rear view camera that helps monitor jobsite conditions. An audio/visual travel alarm system informs crew members on the ground. The RCL monitoring system provides the operator all lift information, is extremely intuitive and allows the operator to set swing and other control parameters creating virtual walls with audio, visual alarms and function kick out. 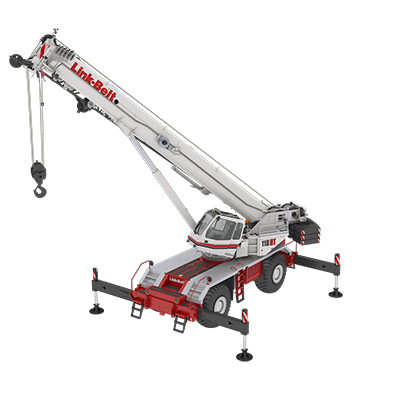 The 110-ton (100-mt) HTC-86110 telescopic truck crane features a 164 ft. (50m) main boom that outreaches the truck crane competition and challenges European-built all terrain cranes in its class. The main boom tip height is 172.6 ft. (52.6m). The telescoping sections of the 6-section pin and latch boom ride on Link-Belt’s proven Teflon impregnated wear pads, which means there’s no need to grease the bottom of this boom. Plus, all the sheaves and both pins of the hoist cylinder feature sealed bearings as well. Available is a 58 ft. (17.6m) on-board fly that features four offset positions of 2, 15, 30 and 45 degrees, and an innovative approach for erecting and stowing, focusing heavily on minimizing the number of times a ladder is needed. The fly also features an integrated 10 ft. (3.0m) fly that reeves up to 4-parts of line and is capable of 26 US-ton (21.7mt) lifts. 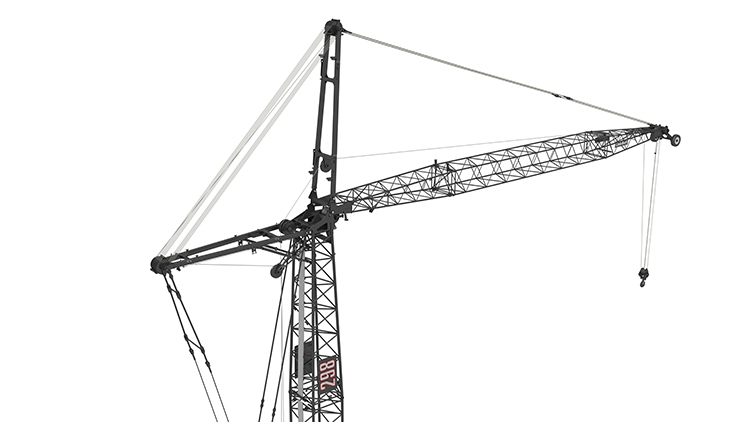 The 10 ft. (3.0m) fly is ideal for applications where two load lines are necessary for lifting one load. Two additional 16 ft. (4.9m) lattice boom extensions bring the maximum tip height to 261.6 ft (79.7m). Based on ongoing operator and customer feedback, the intuitive design of Link-Belt Pulse 2.0 crane operating system provides a simple interface for crane operators with a larger display, along with programmable features that allow each operator to customize their display; and software can be updated remotely. The most visible difference to Link-Belt’s Pulse 2.0 is the new 10 in. (25.4 cm) display, 47 percent larger than the original Pulse screen. It has been carefully selected to deliver a high resolution screen tough enough for harsh operating environments. A resistive touch screen can be used with gloves and be seen in direct sunlight with larger, clearer images; and the unit is pivot-mounted for optimal viewing. The interface is more dynamic throughout the operating system, with larger buttons and interactive indicator lights displayed on the margins.